Sandra Mantu is researcher at the Centre for Migration Law (CMR), Faculty of Law, Radboud University Nijmegen (NL). In 2014, Sandra defended her PhD thesis that dealt with the legal rules and practices of citizenship deprivation in a selection of EU Member States and their link with EU citizenship. She has been involved in several EU funded projects looking at the legal aspects of EU citizenship and EU migration and mobility frameworks. 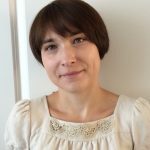 She is currently key staff member in the CMR’s Jean Monnet Centre of Excellence work programme and main researcher in EXPULCIT a project that focuses on the expulsion of EU citizens from host Member States. Her most recent publication is a co-edited volume with Carolus Grutters and Paul Minderhoud, Migration on the Move – essays on the dynamics of migration (Brill 2017).